Explore our coastline and enjoy the benefits of learning outside the classroom. Ysgol y Môr, School of the Sea, offers a series of activity days on the North Wales coast, packed with tasks and challenges for primary aged children. You can teach on the beach or go afloat on the Menai Strait. Explore beyond the confines of the classroom and take your maths challenges on to the water, your biology or geography investigations on to the rocky shore and bring history alive teaching amongst the forts, castles and bridges of our fascinating coastline. Using our amazing marine environment, the teaching opportunities are endless. 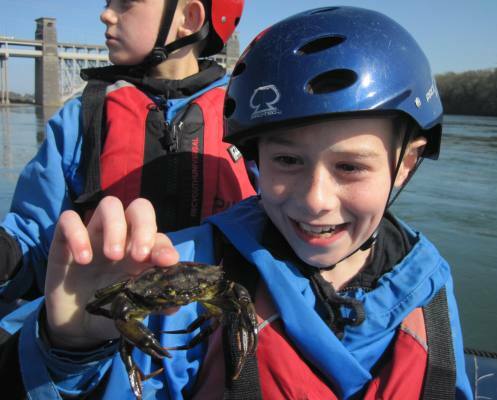 With links to the curriculum, the Ysgol y Môr activities are designed to enhance teaching, make learning engaging and exciting using the natural environment along the shores and and afloat on the Menai Strait. The activity days are easy to fit in to the school year. Our friendly and informative instructors will work alongside your class and take you on the water. To find out more about Ysgol y Môr for your school, please get in touch.